Yea!!! We made it to Colombia. The passage was as expected. I would like to say it was boring but it turned out to be lively. Winds were forecasted at 20 knots most of the way but as usual the forecast was a little underestimated. We plan for this. For the most part, winds were 25-30 knots (29-35 mph). Since the winds were from behind us and we are moving with the wind, this makes digesting higher winds tolerable. 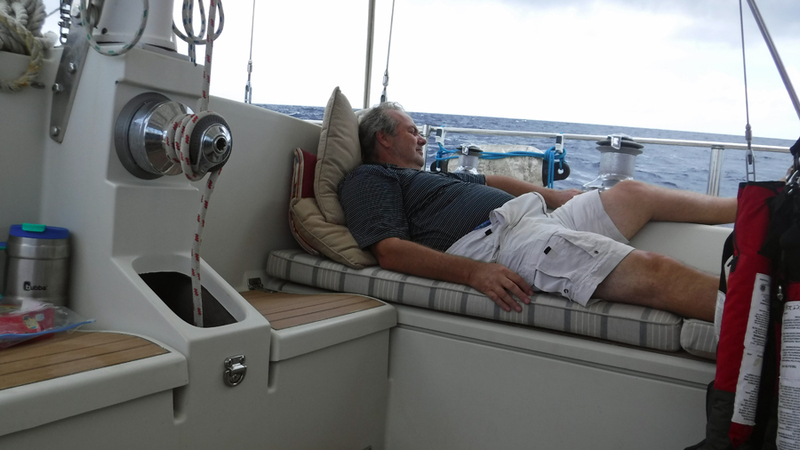 Sleeping was difficult during the 48 hour passage. We both napped whenever we could but arrived very tired in Santa Marta. In fact more than tired, we were darn right exhausted. The very last part of the trip we had sustained winds of 40 knots (46 mph/74 kph). This was about 2am to 6am near the Isla de La Aguja. We expected wind here to pick up as were warned by other sailors about this area. Winds here whip around the mountains and the area is notoriously dangerous. 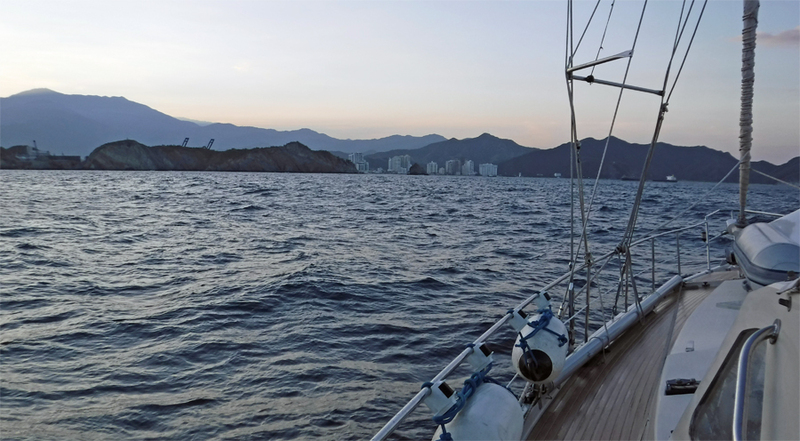 This lasted for about 4 miserable hours and then as we approached land and Santa Marta the wind became calm and we both sighed with relief. We made it. We had a couple of things break along the way, nothing big. The first thing to go was a hose clamp on the engine. This was easy to fix and took less than 5 minutes. We carry spare clamps of all sizes in our spare parts inventory. The hose clamp was on the exhaust side of the engine meaning nothing messy spilled. Our multimeter blew a fuse. This is the gadget telling us what sort of electricity we are plugged into or using. It will tell us if we have 220 volts, how many amps or kilowatts we are using and if the frequency is 50 or 60 hertz. I started our generator on the first night to charge the batteries we use to run the boats systems. The unit lit up momentarily and then went dark. I’m not sure why this blow a fuse but I’ll have time to figure it out while here in Santa Marta. When Cindy was on watch she noticed the monitor for our ship’s navigation computer flicker. Then it went dark. This is a critical piece of equipment. Without it we have no idea where we are, where we are going or when we’ll get there, if at all. Being that it is a vital piece of equipment we carry a spare. Cindy keeps track of where we stow things aboard Cream Puff. Honestly, there is so much storage space she does a great job of keeping a spreadsheet updated to help locate items we may need. Within a couple of minutes she got the spare monitor out and we had it replaced within 15 minutes. We’ll replace the broken one in Santa Marta and continue to keep a spare. Our deck light bulb decided not to play anymore and burned out. Do you see a theme here? This is located half way up the mast and shines onto the foredeck at night on the off chance someone needs to go forward. We have hardly ever used this light since Amel boats are designed for the sailors to stay in the safety of the cockpit during offshore passages. That being said, read the next paragraph. The boom lift rope broke. This is a piece of rope and cable holding the boom up when the sail is not out. Luckily I noticed the broken boom lift because it was at night time when it broke. It is amazing how a new sound can peak ones awareness something is not quite right. We both heard the loose wire cable waving about as it became entangled in the rigging. It slapped against the mast a couple of times and destroyed the block at the end. 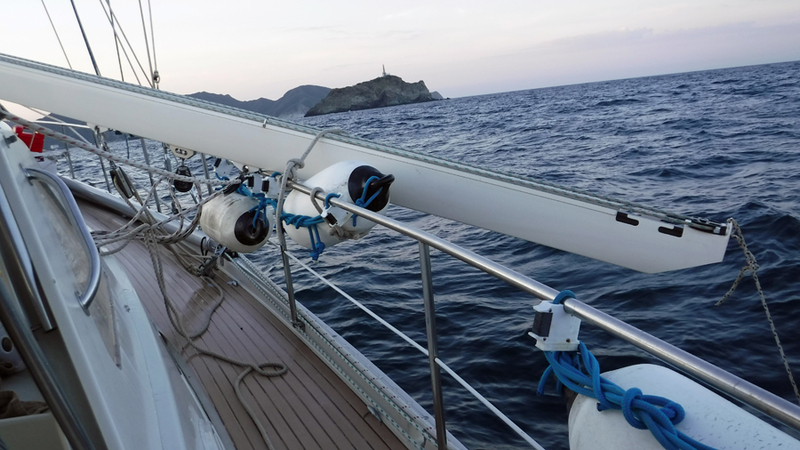 As we neared Isla de La Aguja we needed to furl our mainsail because of the increasing winds. I put a life-jacket and harness on and went on deck as Cindy worked the sail in from the cockpit. It sure would have been nice to have a working deck light. Amel boats have electric furling sails. This was one time I was really glad about this part of the design. As Cindy worked her piece from the safety of the cockpit, I gently rested the boom on the side rail and lashed it. This was where it stayed until we approached port and the safely of calmer waters. This is not a big deal to fix. However, going on deck with big waves and winds while tethered to the boat at night is not something I look forward to doing again. Speaking of darkness; we had an added bonus for this trip. When making any passage our primary concern is the weather, mostly the wind. The added bonus was the moon was almost full and rose at 8:30pm on the first night and at 9:30pm the second night. The moon stayed up until morning. Sailing with a full moon is an incredible experience. 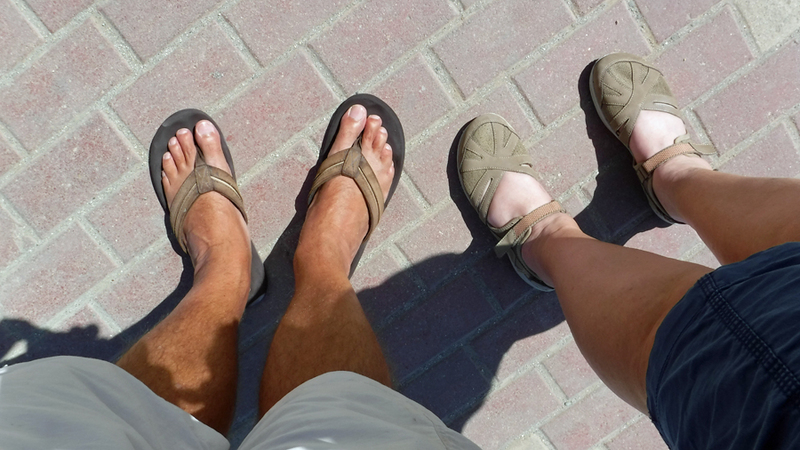 It is amazing how well we can see and without the hot sun we both had to reach to the back of our closets for sweaters. The sun sets at about 6:30pm. This give us about 2-3 hours of complete darkness before the moon comes up. We are talking can’t see your hand in front of your face kind of darkness. Being on the ocean and hundreds of miles for any major city there was no light pollution. This makes the perfect condition to look at stars. I am not a good enough writer to paint a word picture of how incredibly beautiful this is. All I can really say is it was awesome. Cindy made me laugh when she said, “There are so many stars there isn’t room for any more”. The stars have a sort of three dimension effect and look like they can be touched when reaching out. The sky was completely clear of clouds and haze. I have never seen stars like this in my entire life. Moments like this make me absolutely indifferent about the stuff breaking on the boat. It is moments like this that really make me appreciate our lifestyle and how lucky we are to experience nature in such a way few others get to see. This is the first time either one of us has been to Colombia. We are so looking forward seeing the sites. I had a friend from Colombia in the USA and he often told me how beautiful it is and how Colombia has an undeserved bad rep in the USA because of the over exaggerate drug trade and stereotyping by the entertainment industry. He often suggested I should visit. This is the first time either one of us has visited South America. We have both traveled extensively but for some reason not to South America. Wow! A whole new continent to explore. This is the first time we have sailed to a new continent. We have sailed to many countries and islands but this is the first time we have landed on a new continent. Very cool! This is the furthest south we have sailed so far in our wacky little adventure. 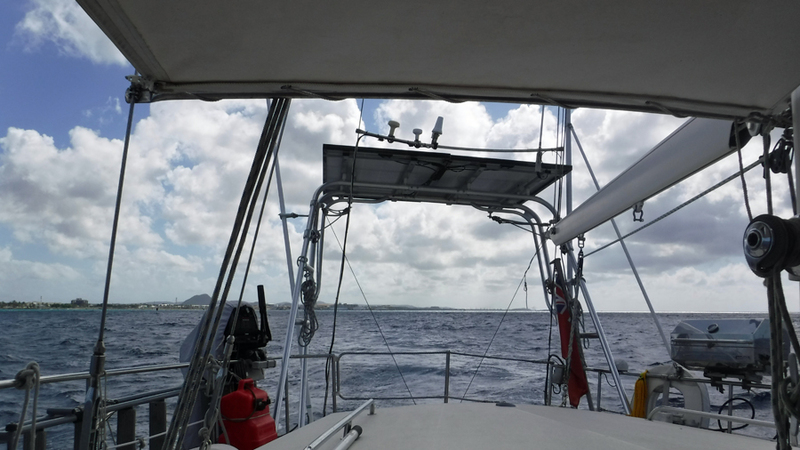 Last year we sailed to Grenada at the lower of the eastern Caribbean islands. Until now that was our lowest latitude. 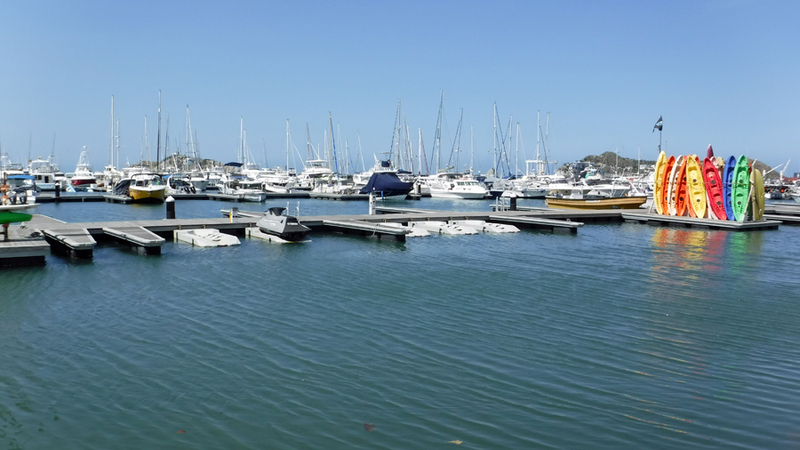 Santa Marta, Colombia sits a little bit lower in latitude at 11°14′ than Grenada at 11°59′. I guess we could technically also say Curacao Kline as well since it is pretty much the same as Grenada. We’re getting closer and closer to the equator. We sailed in winds of 40 knots. This is not something I would like to do every day but at least we know we can handle the conditions should they arise again. We have had gusts to winds of this speed for a few minutes when hopping between the eastern Caribbean islands but never sustained winds like this for about four hours. The boat handles these conditions much better than us. Cream Puff was designed for a lot worse than this. But, we weren’t. As I mentioned earlier, we were shattered upon arrival in Santa Marta. 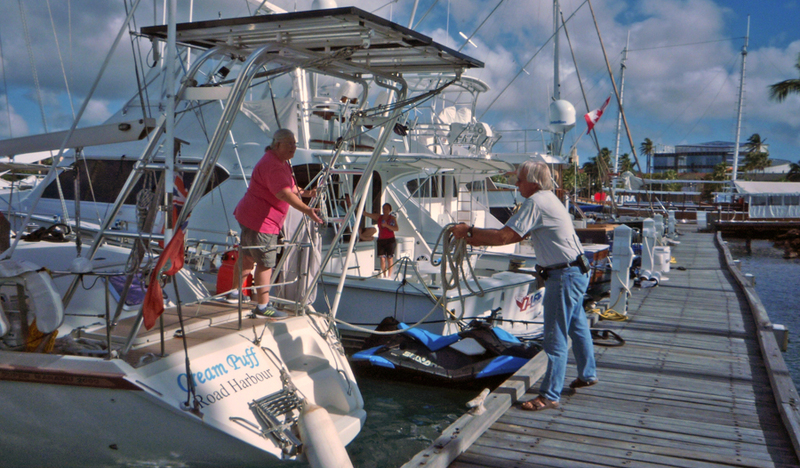 It was early morning when we arrived and the marina dock-hands had just reported for work. We cleared into port with the harbor master and port authority using our VHF radio and then radioed the marina for our slip assignment. It took them a little while to reply. I think they were getting coffee ready to help them wake up. I can’t say I blame them. It was early. We circled for a little while outside of the marina in the port area. The harbor master called us to make room for a big tanker who was leaving. He did so in very broken English. I got the gist of the conversation when I saw the huge ship and tugs coming our way. Yep! Let’s get out of the way. It’d be a real shame to get all the way here only to collide with a massive freighter and sink in the harbor just a few yards away from our final destination. 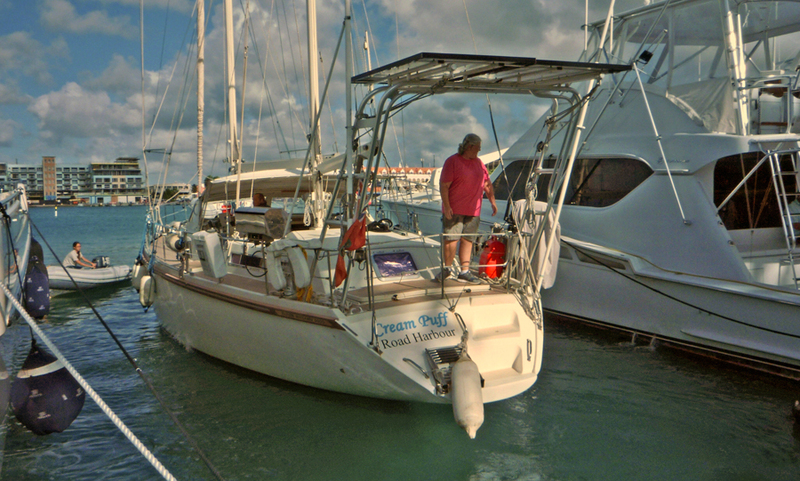 After we had Cream Puff settled in the marina slip we showered and went to bed for a couple of hours. It seemed like just a couple of minutes later there was knock on the boat from Customs and Immigration officers wanting to check us in. It wasn’t just a couple of minutes, it was three hours. We were both in comas. We were the only boat arriving and they wanted to leave for the day. Sleepy eyed, we followed them to the office to start the clearing in process that can take up to 2-3 weeks to complete. We are excited to be in Colombia, South America and can’t wait to begin exploring. We’re standing in South America. How cool is that!